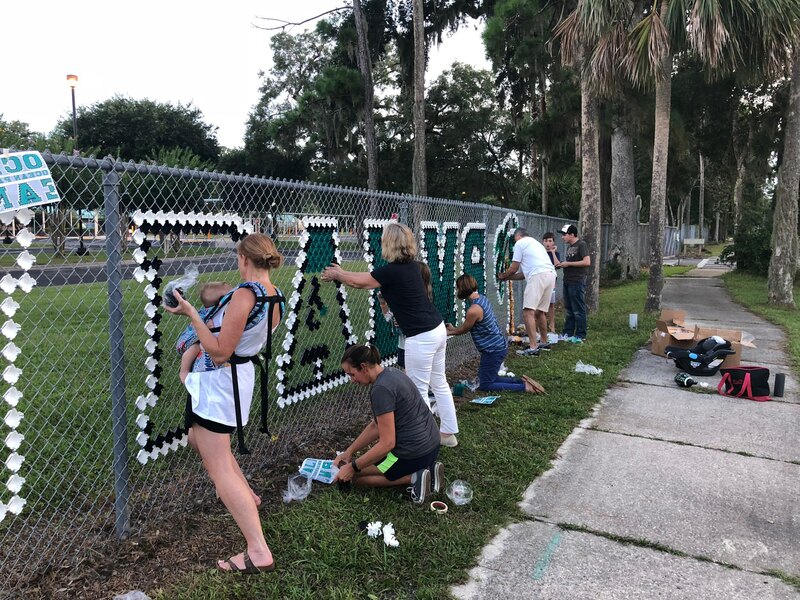 The PTO organizations are a critical piece of what makes Ponte Vedra schools so special. The PTO board members, indispensable. Kelly Simmers is starting her second term at Ocean Palms Elementary, and it is a much different landscape from last year, as the student population has been cut dramatically – ~1200 students down to 500 students – now that Nocatee’s new Palm Valley Elementary is open. What made you want to take on the job of PTO president? I wanted to be PTO President because I love Ocean Palms! We are so fortunate to have such a great public school in our neighborhood, and I really want to help however I can. What are your top two goals this year? One of my goals this year is to take advantage of being a small school. I know that our numbers will grow again, so I think this year is a great time to try some new things! Another goal for this year (and every year) is to raise as much money as possible for our school and to have fun doing it! What is most striking to you about OPE as you begin your first year as PTO president? The good? The bad? This is my second year as OPE PTO President, and I’ve never been more in love with our school! What is most striking to me about Ocean Palms is the way our teachers, staff, and families live our motto: Everyday. Everyone. Everything matters. Do you have a fundraising goal? If so, what is your number? Our fundraising goal is $100,000. How much did the OPE PTO raise last year? Lessons? Last year we raised $187,000, which was amazing! We are a much smaller school this year, so we adjusted our goal accordingly. If you could ask one thing of each parent at OPE what would it be? I would ask every Ocean Palms parent to consider that a school as special as Ocean Palms doesn’t just happen. It takes a lot of hard work and heart from every teacher, staff member, administrator, student, and family. Ocean Palms is the incredible school it is because there is a culture of giving generously of time, money and talents. Everyone can add value to our school. If you don’t have time to volunteer, maybe you can contribute financially. If you’re not in a position to give volunteer hours or money, you can help by staying informed about school happenings and telling your friends and neighbors that OPE is the best! Any tips for newcomers in the community starting school? Welcome! Please check out our PTO Facebook page, attend a PTO meeting and introduce yourself! You’re going to love it here. The PTO is for everyone! We raise money for every student, teacher, and staff member. And we welcome everyone in our meetings. Please join us in supporting our wonderful school!